Artnet published an article on what they dubbed ‘The Weinstein Effect,’ detailing the effect of gender inequality and sexual harassment on the art featured at Art Basel Miami Beach in December 2017. The article focuses on the feminist energy present at Art Basel and a panel discussion in which Zoe Buckman participated. 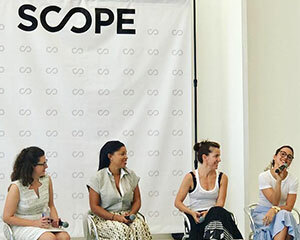 “We’re in a moment, we’re in a movement—perhaps even the beginnings of a revolution—right now,” said artist Zoe Buckman during a panel discussion on “Feminist Art for a New Era” at the SCOPE Art fair. Buckman showed a cluster of monumental boxing gloves covered in scraps of wedding dresses at Gavlak Gallery’s booth at Art Basel.